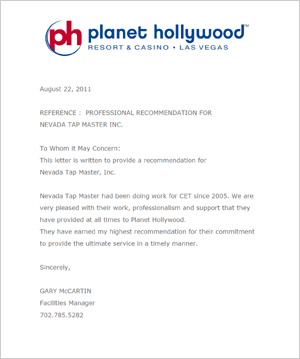 I want to thank you and everyone involved at Tap Masters with helping Clark County School District Maintenance Department restore cooling back at Reedom ES in such a short time period we couldn't have done it without your professional team members, thank you guys so much. We recently finished a major project out at the Venetian and Sands in Las Vegas. This project was our biggest mechanical project yet and as a very small company I relied on my subs to do their part with no problems. So I called Dave and asked him to help us with (14) hot taps. 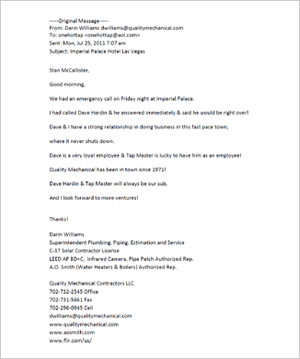 I’m use to Dave showing up and doing the work so when he sent someone else I was a little worried. Kyle Hymer showed up early and I showed him all the locations once. I left and went to the other side of the property where I was working. The only time I heard from Kyle was when he was done and there were no issues. He remembered all the locations which is piece of mind when you have a million things going on and is priceless. The professionalism and having everything ready and on time is outstanding. Kyle recently did (2) 4” hot taps. We had a problem with our valves holding so I asked Kyle if he could wait for us to remove and reinstall the valves. He said no problem and was very patient and worked with us. Crown would like to request that Kyle be on all Crowns jobs and if he is busy we’ll reschedule until he is available. I want to take the time to let you know that Dave Hardin and crew is doing a awesome job for Quality Mechanical! We are always going 24/7 and to know that Dave is right there ready to jump in, with these last minute discussions! This town is so busy at times and Dave brings a high standard of magnitude to the table! I would highly recommend your staff, You should be thankful for what you have, he has put a good team together and has great people skills.